RainSaucer - How do I store my RainSaucer? How do I store my RainSaucer? Unless it rains year round in your area, you will most likely have a Season when you will not be collecting rain. For those on the West Coast, that Season is Summer (no rain just 5 months of Drought). In the Northern regions of the Midwest and East, that Season is Winter (our products are not rated for snow). During those off-Seasons, we highly recommend you store away your RainSaucer to increase its longevity. Fortunately, take down is easy and there are multiple ways to store the RainSaucers disks. Hanging on the wall: in our experience, the holes at the outer edges are strong enough to support several months of placement on a hook or nail. Wall hanging is also a nice space saver. Standing upright between wall and rack: the disks are thin enough that they can easily slide between the wall and a storage rack in the garage. The key is to make sure the fit is tight so that there is no buckling at the bottom. 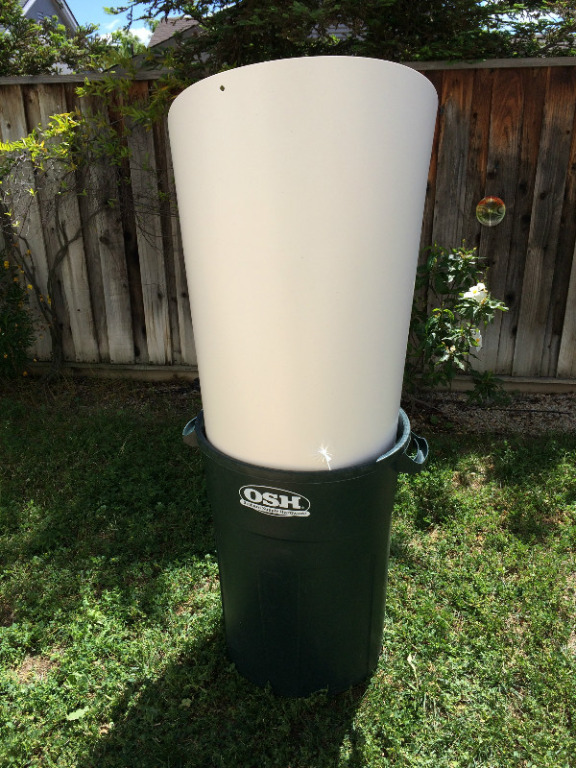 Roll up and store in a rain barrel (see photo): if you’re storing your RainSaucer and rain barrel both, why not put one inside the other? The RainSaucer disks can be rolled into a cylinder and dropped into your open top barrel, drum or container. Finally, if you are the proud owner of an 84” RainSaucer, you only need to store the white fabric sheet. The remaining metal parts are made from galvanized steel and should have no trouble weathering the off-Season.